"Where are you sleeping tonight?” Most of us have the comfortable, ready answer. But there’s a population in the territory and elsewhere who can’t come up with that answer. The homeless can’t say for sure. Volunteers crisscrossed the territory Saturday to find answers to that and other considerations in the Point in Time Homeless Count, a nationwide event conducted every two years by the U.S. Department of Housing and Urban Development. Options for spending the night included the street or sidewalk, under a bridge or overpass, in an abandoned building, a park or a vehicle. By a large measure on St. Thomas, abandoned building was the answer. The derelict Michele Motel, a former mental health facility, has become a "home” for 30 or more people who have nowhere else to lay their heads. Louise Petersen, director of the Methodist Training and Outreach Center on St. Thomas, explained the interviewing process Saturday. 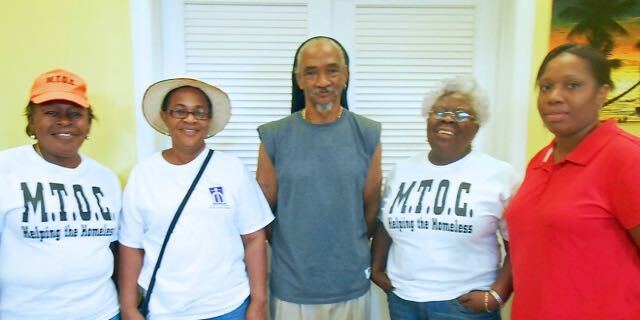 The MTOC or Catholic Charities conduct the biennial surveys. The count helps agencies allocate funding and is helpful in obtaining grants to help the territory’s homeless people, Petersen said. In 2013, volunteers counted 437 people without homes across the territory. The numbers for Saturday won’t be final until next week. She knows whereof she speaks. She has as been at this for years. Established in 2002 to connect the homeless population with available services and shelters, the agency is the central homeless outreach center for the territory. "We send teams of three out to different neighborhoods, one to interview, one to take notes and one to distribute meals,” Petersen said. Speaking Saturday while awaiting the volunteer teams, Petersen said, "When I look at the conditions and situations people live in, it brings tears to my eyes. I want to ask ‘What happened to you?’ You want to help. Sometimes, you cannot reach them, but even if you help one or two, it makes a difference. About then, the team that had interviewed the Michele Motel community –Richard "Sky” Gomez, Bethlehem House shelter manager, Andrea Shillingford of Catholic Charities, and Charities intern Keyra Espirit – returned. The women, first-timers on the firing line, were still shaken by the experience, though they were accompanied by veteran Gomez and Charities director Michael Akin. In addition to Michele Motel, they had interviewed the Brewers Bay, Lindbergh Bay, Frenchtown, Simmonds Alley and Emancipation Garden homeless. 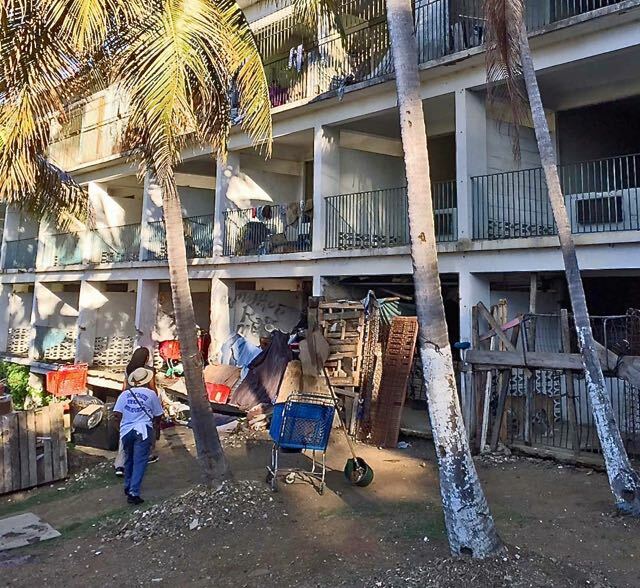 Gomez, who is as familiar as anyone on the island with the homeless community said that he has personally taken Anna for clinic visits, but "she isn’t always cooperative.” Gomez distributes the meals that Catholic Charities donates each day over the island. The young intern Espirit also expressed concern. "I couldn’t believe the dirt, the filth they live with,” she said. Speaking from vast experience, Gomez explained the mores of the motel community. Shillingford said she wouldn’t sleep well tonight. "I will still be seeing Anna,” she said. Gomez made clear he doesn’t condone the conditions. "The community and the government need to get together and do something about it. It’s us, you know, it’s our community,” he said. St. Thomas was thoroughly covered. Petersen said MTOC staff covered the East End – Red Hook, Nadir Frydenhoj, Tutu Mall and Southside, as well as Long Bay, Granboko, Sub Base, Caret Bay and Bordeaux. One group of volunteers covered Havensight and Crown Bay. Another took Garden Street, and Roosevelt Park; another took Market Square; and another Savan. Petersen praised the volunteers’ work, with the wish that they had had more. Final figures for all islands will be available next week, she said.